With her new show at Adamson Gallery, Yuriko Yamaguchi takes a step away from nature, but only to get a different vantage point on it. 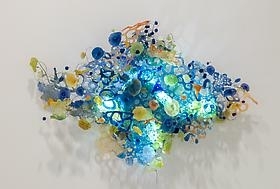 “Interconnected: Science, Nature, and Technologies” consists of six hanging or wall-mounted installations, made of hand-cast resin shapes connected by metallic wire. Some also include LEDs, which add steady illumination to the glimmers and shadows caused by ambient light. Although long based in Northern Virginia, Yamaguchi was born in Japan, and her work evokes forest-set Shinto shrines and garden-enclosed Buddhist temples. “Interconnected” draws on such associations but also uses and depicts technology. The four pieces in the “Cloud” series, which extend across the room’s longest wall, could be symbolic depictions of DNA, neural synapses or computer networks, as well as vaporous puffs in the sky. The steel, brass and copper wire that holds the clusters together also suggests technological connections. Among Yamaguchi’s inspirations is John Cage, the American composer who was strongly influenced by Zen. The “Interconnected” constructions have thousands of facets, yet Yamaguchi writes that they reflect “my complex emotional paradoxical feeling of nothingness.” The space among them, it seems, is just as important as the components themselves.